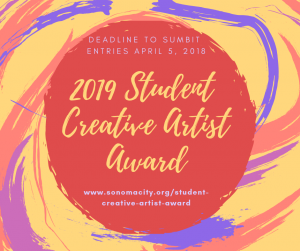 The City of Sonoma Cultural and Fine Arts Commission's Student Creative Artist Award Program began in 1988 as the Honorarium Program. It changed to the Steve Silver High School Honorarium in 1992, and became the Student Creative Arts Award Program in 2002. It is open to Sonoma Valley residents between the ages of sixteen and twenty-one who demonstrate unusual promise in the visual, literary or performing arts. Applicants submit an application, a 200-500 word statement explaining the role that art has played in their life and what their plans are for continuing their artistic training, along with a portfolio of at least five works. All applicants are then asked to participate in aninterview process with the commission members. The winner is awarded a $2,000 cash award to be used for the furtherance of their artistic abilities, education or career.